One of Bethesda's QA testers has beaten the highly anticipated RPG in an impressive two hours and sixteen minutes. To a given value of "beaten," of course. Presumably QA tester Sam Bernstein didn't see too much of Skyrim's verdant scenery as he scuttled from quest to quest in a bid to beat development team rep Jeff Browne to the end credits. Bernstein's final time was a lightning-fast 2:16:10 - twenty seconds faster than Browne's effort. The speed run competition was held to celebrate Skyrim's imminent launch and cheats were not allowed. 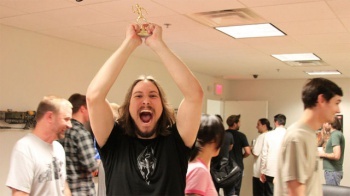 Bernstein, who can be seen basking in the august rays of victory above, received a small trophy for his troubles as well as a pie of his choice, baked by director Todd Howard. Bernstein also won the speed run competition for Fallout 3 back when it launched, finishing the post-apocalyptic RPG with a final completion time of 75 minutes. Not bad. Of course, regular gamers who haven't been playing Skyrim non-stop for the past year - or designing it for that matter - probably won't get through the game quite that fast. Bethesda has claimed it will take players around 30 hours to beat the game's central quest, not including the time it takes them to father (or mother) a dynasty of lizard children. You can take your best shot at Bernstein's record when Skyrim launches on November 11th.